This photo says it all. Good food and wine, good friends and great play-reading. 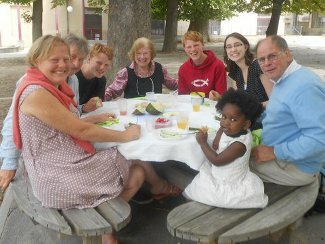 It was so nice that David Albrecht, who had taken the service, agreed to join us, as well as the Bullock twins who were in Bordeaux for the weekend after their trip to Spain. We read the first Act of “The Mousetrap” which ended with a body being discovered in the dining room, leaving everyone in suspense as to which house guest is the murderer! We will find out next month. Little Tifi provided the background music! A happy afternoon was enjoyed by all!